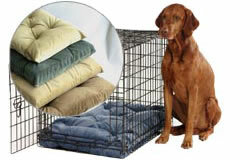 Bowsers Tufted Dog Crate Mat - An elegant upholstered look for your dog's crate. Distinctive tufting combined with luxurious, easy care microvelvet. This is the great mat that Bowsers uses in their pet beds. Additional Colors: The Tufted Cushion comes in every color that Bowsers Donut & Double Donut come in. If the color you want isn't listed please enter your choice in "customer comments" in the shopping cart".